Valves are weakly arcuate, with distinct, broadly rounded biundulate dorsal margins. 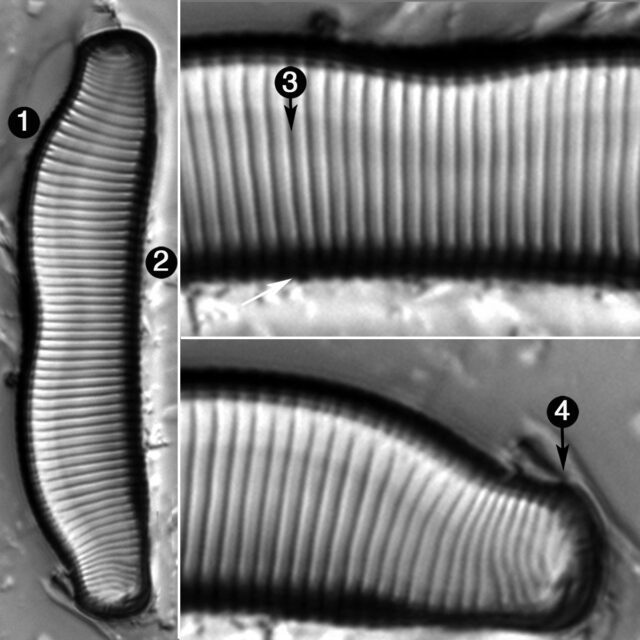 The apices are subcapitate with ends that are obtusely rounded, 5.9-7.2 µm wide. Helictoglossae are present on the ventral margin, near the apices. The raphe curves onto the ventral mantle toward the center of the valve, terminating at ventral undulations 1/5 valve length from the ends. Transapical striae are nearly parallel, becoming curved near the ends. Shortened striae are infrequently present near the dorsal margin. A narrow sternum is present near the ventral margin, visible near raphe at the apices. Areolae visible in LM, occurring 28-31 in 10 µm. Internal openings of the areolae aligned in a narrow groove. The distribution of E. bidens has been reported as ranging from the Arctic (Antoniades et al. 2008) to tropics, occurring in oligtraphentic, acidic waters of low conductivity (Lange-Bertalot et al. 2011). Eunotia bidens has commonly been found associated with bryophyte communities in swamps of the Mississippi River Delta (Burge 2014), and stream of Great Smoky Mountains National Park (Furey et al. 2011). Burge (2014) found E. bidens occurring in less than 30% relative abundance among the epiphyton and benthos of cypress-tupelo wetlands with: 22.2–27.4 C, 5.6–7.4 pH, specific conductivity 71.2–834.0 µS/cm, 8.1–321.0 NTU, DO 0.1–7.7 mg/L, NO3-N 0.01–0.3 mg/L, NO2-N <0.001– 0.1 mg/L, orthophosphate 0.02–2.08 mg/L, and TP 0.11–3.93 mg/L. Other common species were Eunotia formica, E. bilunaris, E. metamonodon, and E. superbidens as well as species of Gomphonema, Navicula, Nitzschia, and Pinnularia. E. bidens, striata, ventre plano, dorso convexo medio exciso (bidentato), apicibus dilatatis truncatis. = E. Diodon apicibus truncatis. Valves are dorsi-ventral, with weakly curved with biundulate dorsal margins. Dorsal undulations are broad, where as ventral undulations are small and narrow. Striae are coarse, becoming denser near the ends. Apices are subcapitate with obtusely rounded ends. Small ventral undulations coincide with proximal raphe endings.